In this post, we've compiled AI landscapes published by various authors and provide links to sites where you can explore more. Where is investment money flowing and what segments are hot? What problems are being addressed? What are the different approaches to solving the problem? Where is the disruption happening (processes, business models, products)? Who is seeing things differently? What is going on at the edges (or what are the crazy people doing)? AI products also address more specific customer service functions like self-service, speech interfaces, routing, KM, etc. 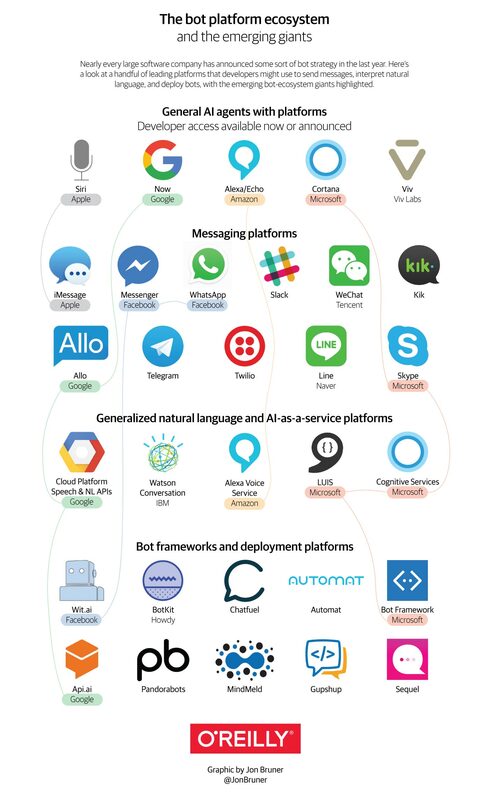 Landscapes focused on Chatbots, for example, will look at the core technologies, platforms, and frameworks needed for Chatbots. 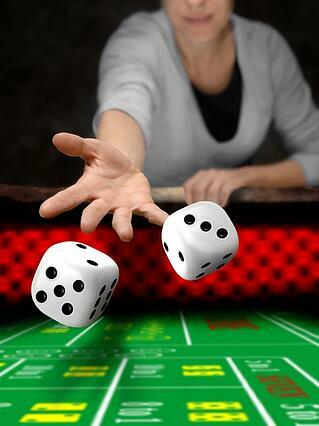 So let's investigate the AI landscape and see where the bets are being placed. This landscape view is published by BloombergBeta, a VC investor. As background, BloombergBeta has "invested in 35 machine intelligence companies solving 35 meaningful problems in areas from security to recruiting to software development." They have "tried to capture the most-important startups in the space in a one-page landscape." These guys are making bets. Takeaways: Investors believe customer service is a disruptable enterprise function. Take a look at some of the companies and their use cases to so see what disruption looks like. 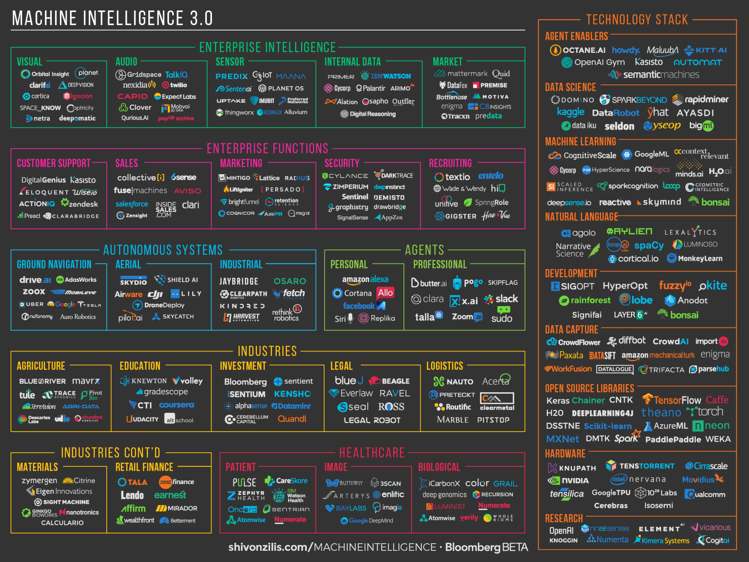 The Machine Intelligence 3.0 landscape above had a segment called hardware. Hardware is actually incredibly important to machine learning as the amount of computing resources needed to build and run AI is significant. 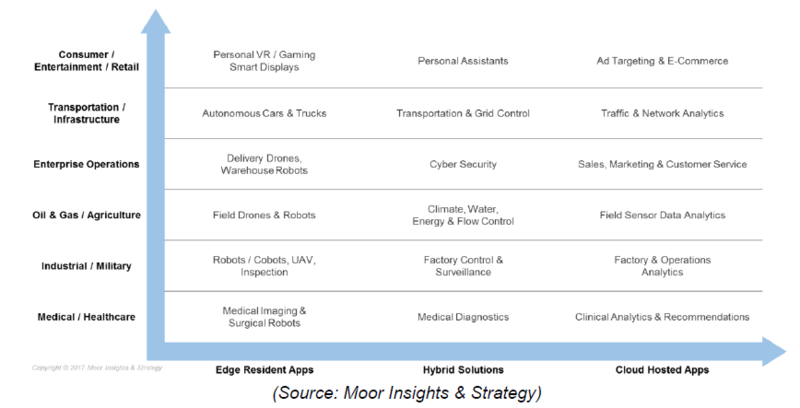 Moor Insights and Strategy is a technology analyst and advisory firm that has a published an AI landscape based on applications and required hardware to make machine learning apps run. MI&S says machine learning apps are starting to move out of cloud deployments where they support internal enterprise functions (including web) to edge devices. So "smarts" is being embedded in devices and things (IOT). This view of the landscape is not one you typically find,so I recommend you their blog on this topic and download their report. When you implement machine learning in your contact center applications, you might need much better IT resources. Smarter devices (with ML embedded) will also have an impact on customer service processes as more IOT-based context becomes part of the experience. 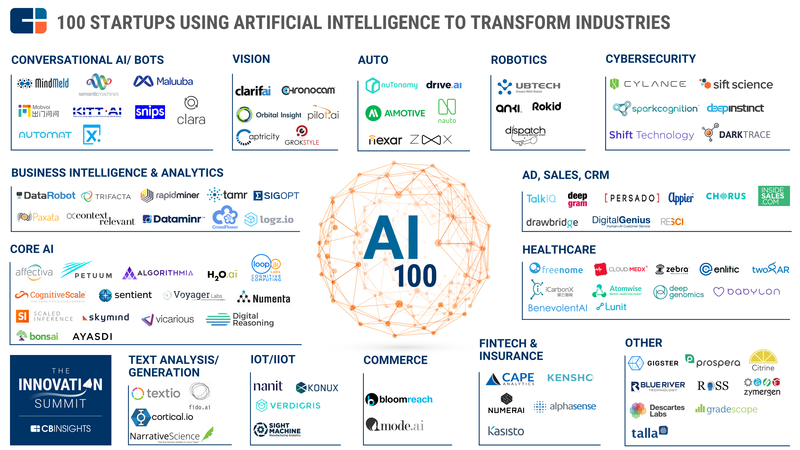 CB Insights (tech market insights company) published a list of 100 of the most promising private companies applying artificial intelligence algorithms across industries in January 2017. They ranked 500 companies and choose the top100 for the AI Landscape of top 100 Startups. CB Insights also segments the ecosystem in technologies, functions and industries. The customer service function is included in the AD, Sales, CRM segment. AI/Bots also covers technology with direct application to servicing. Takeaway: There is an amazing level of investment and energy flowing into these AI companies. These startups are looking at challenges like customer service with fresh, anything-is-possible perspective. You've got to watch these 100 companies: they will directly or indirectly impact how help and service is provided. Bots are directly applicable to customer service use cases. And, "bots are made possible by recent advances in artificial intelligence, user interface, and communication." 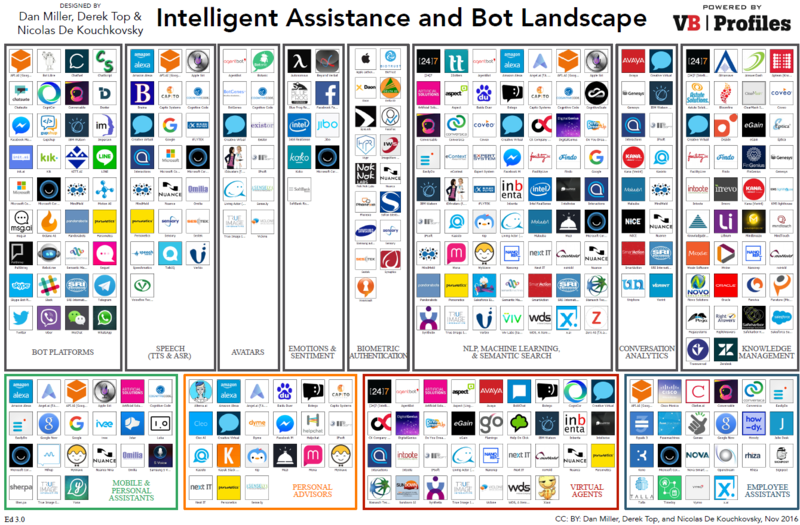 The bot landscape can be thought of a subgroup of the larger AI landscape. Bots: What you need to know blog post from O'Reilly is a must read on the bot landscape. This view covers the major players and the role of each component in the stack. Although Chatbots have had mixed reviews for customer service (so far), they are maturing and becoming more useful. Takeaways: Bots might be immature but nearly every major software company announced a bot strategy in 2016. Watch the trend and the money. This landscape is provided by Opus Research. The IA landscape is focused mainly on customer service and adjacent business processes. Then Opus maps out solutions for four segments: personal assistants, personal advisors, virtual agents, and employee assistants. The Opus landscape focuses mainly on intelligent assistants for transactions, interactions, automation and experience vs. other contact center apps (routing, WFO, etc). Takeaways: This landscape focuses on the contact center and is a good place to start. Dig into some of the companies to see how they are approaching the contact center. There are some very exciting emerging solutions in this space. At some point you will make a bet on AI to help you run your contact center. (Check around... you might have done so already). Other people are already betting big. We've provided five different views of the AI landscape so you can see the market from different perspectives. At a time when we've seen several major contact center infrastructure vendors enter bankruptcy, the landscapes show big money is flowing into AI technologies aimed at customer service. We recommend following these landscapes and digging down deeper by reading the source blogs and by looking at the companies on these landscapes. 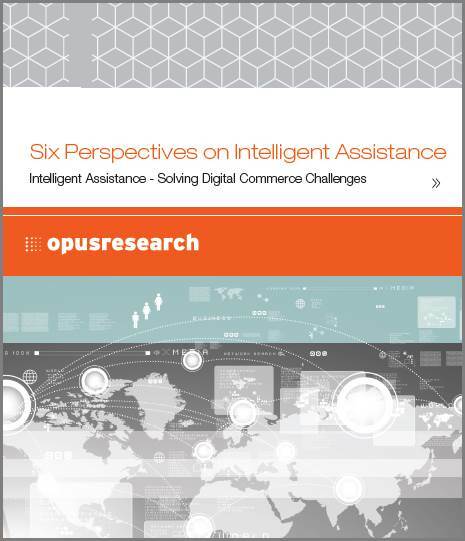 Get your copy of this Opus Research report that looks at IA from six different perspectives.